Stefan Sievert (left), Bob Waters (center), and Jesse McNichol (right) on Jesse’s first Alvin dive. 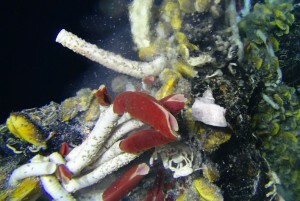 Three days ago, I saw a sight few ever see with their own eyes: deep sea geysers surrounded by weird and wonderful life. Animals, without eyes or arms, gently swaying in shimmering water, nurturing symbiotic bacteria with a witch’s brew of stinky sulfide, oxygen, and carbon dioxide. The water around these vents is thick clouds of sulfur, a by-product of bacterial metabolism, making it hard to see far, even in the bright lights of the submarine Alvin. The area we visited is tiny, and there is absolutely no mark of it on the surface, so we rely on the incredible shipboard navigation systems to place us directly above a site we visited this January. After we dropped 2,500 meters to the bottom, we knew we were close to a hydrothermal vent, but we could only see bare volcanic rock. As Bob Waters, the pilot and expedition leader, moved close to the vent, it slowly materialized out of the cloudy water, and I was struck by the sheer bulk of the three chimneys looming in front of us. Although I’d seen them before on the live video feed on our last cruise, a video really cannot give one as good a sense of the dimensions of these structures as our eyes can. One of the chimneys was spewing 325 degree hot ‘smoke’, and as we tried to take a sample for our colleagues back aboard the ship, it crumbled like cigarette ash in the hand of Alvin‘s manipulator arms. Although massive, these structures can be incredibly fragile, and it’s the Alvin pilot’s nightmare to have one fall on the submarine and pin it down at the bottom. We eventually used a giant scoop to collect some of the chimney, and ‘flew’ on to our main study site. Affectionately known as Crab Spa, it was given this name because local crabs enjoy sticking their rear ends into the warm geothermally-heated fluid. Heat is unusual at this depth. At first I didn’t notice the cold, but after an hour or two on the bottom, I had to put on my sweater and wool socks. 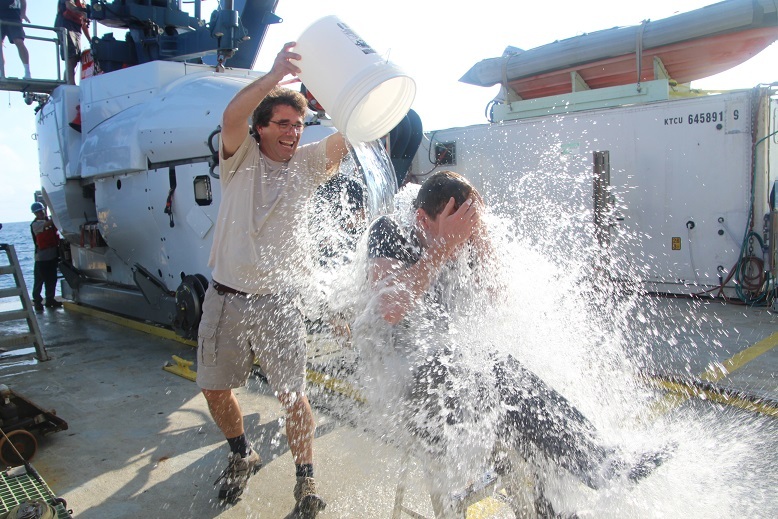 The water around us is only 2-3 degrees Celsius, and as it cools, Alvin‘s sphere becomes ice-cold and drips with condensation. It reminded me that most of the deep ocean is made up of such frigid water with very little life, making these deep sea hot springs with so many big animals so unusual and interesting. The cold also gives you a powerful hunger, and I ate two sandwiches, a pear, and a candy bar while observing. Once you are there, Crab Spa is easy to spot—shimmering fluid with what looks like snow flows out into the surrounding seawater from a hole in the rock. Around it crowd animals, bathing in the warm water. For the first time, I could see up-close the site where the bacteria come from that I studied in January on another research cruise. Seeing it was great enough, but I also had the pleasure to take my very own bacterial samples for the first time. As Bob positioned the sampler in the warm fluid, I triggered the sampler and filled it with 150 milliliters of unique fluid filled with bacteria! 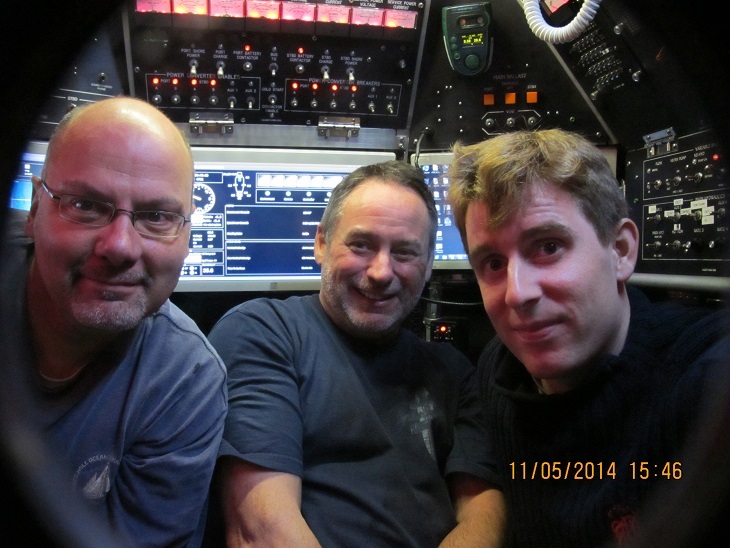 I was lucky to share the dive with Stefan, my PhD supervisor and chief scientist, and his enthusiasm before, throughout, and after gave a great energy to the experience. During the dive, I was very focused on our scientific objectives, and felt sometimes like I didn’t enjoy as much as I should have. But now that I’ve had a few days to reflect on the experience, I feel not only really lucky to have had the chance to dive, but also infected by Stefan’s enthusiasm for these otherworldly ecosystems. Although some might argue that robots can do the same job, there really isn’t anything quite like the excitement of seeing it yourself. Someday maybe I will have another chance to dive in Alvin, hopefully with another eager young student seeing it with their own eyes for the first time!